Orgabliss Herbs And Foods Pvt. Ltd. 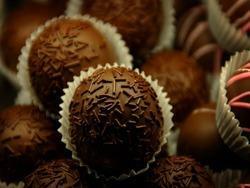 Being a well-distinguished company in the market, we are into offering Chocolate Ball. These almond pops are packed with the delightful zest of chocolate and paired with the richness of dates and honey. They make for a great on-the-go treat so toss one into your bag and you can have it whenever you feel hungry- at office, in a traffic jam or as a midnight munch. 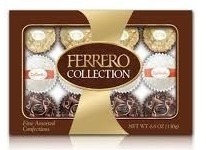 Send 16 Pieces Ferrero Roucher Chocolate Box to all over India. Entice your acquaintances with the happiness extravaganza. The ambrosial chocolate arranged beautifully in a box is a classy choice to impress your special interests. - 6 Chocolate Balls in one package. In order to become one of the favored business names in the market, we are readily indulged in providing to our customers an extensive assortment of Chocolates. Our organization hold expertise in providing superior grade Handmade Chocolate to our precious customers. Our offered Golf Balls Shaped Chocolate is widely appreciated by our customers, which are situated all round the nation. Known for its best quality, clients can avail this Golf Balls Shaped Chocolate at industry leading prices from us.